Through continuous improvement, with the use of SPC charts and TIPPS™, one can be assured a high quality standard that you, the customer, deserves. Pak-Rite has an experienced staff of Packaging Engineers that will work directly with you to ensure that your package gets maximum protection and quality at a cost savings. Pak-Rite Industries is committed to utilizing proven workflow processes that can be tailored to any companies specific packaging and display needs. 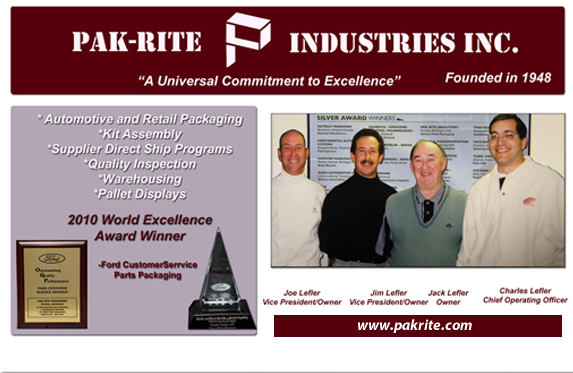 By partnering with the Pak-Rite team you will add efficiency and profitability to your companies distribution. Pak-Rite Industries has all the right tools and machinery required to successfully launch any companies product to the marketplace with "Just in Time Delivery." Our dedicated and highly trained personnel can provide your company all of our services with intense focus on quality and customer commitment. Contact us today! PakRite continues to serve as the benchmark example for all FCSD packagers to follow. Keep up the great work! Now that we are on the backside of the EEC transition, I wanted to take a moment and extend a “thank you” to you and your entire team for your assistance during this change. I consistently l receive feedback from the Ford team that your organization is extremely flexible and accommodating toward solving day-to-day issues. It is a pleasure to work with a supplier that is always willing to extend a helpful hand with a common goal. Please extend out sincere thanks to your entire organization. Keep up the good work!